Britain is turning into a nation of coffee drinkers, with the number of outlets more than doubling in ten years to 20,728. It means there is now one coffee shop for every 3,000 people. And experts forecast there could be 30,000 by 2025. Ten years ago there were just 8,887 outlets in the UK. Sales are up ten per cent this year on 2014, with the market worth an estimated £7.9billion and Britons drinking 2.2bn cups of coffee in shops. The big three brands – Costa, Starbucks and Caffe Nero – have over half of the market. 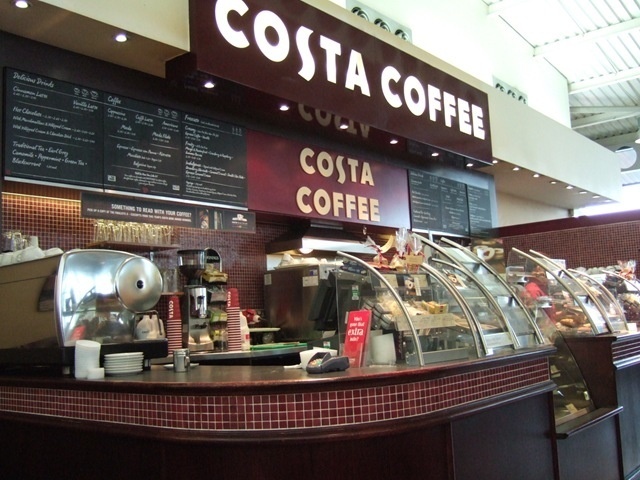 Costa has 1,992 branches, Starbucks 849 and Caffe Nero 620. But pubs, fast food chains, supermarkets and retail stores are all jumping on the coffee bandwagon, according to a report consultants Allegra Strategies. The report said: ‘After 17 years of considerable growth, the coffee shop sector continues to be one of the most successful in the UK economy. ‘Coffee quality is now expected and is being constantly improved across the sector due to the influence from both artisan chains and independents. Allegra Strategies managing director Jeffrey Young said: ‘The explosion in coffee shops certainly seems to be defying gravity. ‘Of course, there are social factors helping the boom in numbers as society becomes more mobile. People can pop into a coffee shop, grab a latte and use their laptop or smartphone to get on with work.